The Rhine is not only one of Europe's most beautiful rivers, it's also one of the continent's most important waterways, flowing some 1,320 kilometers from Switzerland all the way to the Netherlands and the North Sea. One of the most appealing sections of this mighty river flows through Germany's Middle Rhine Valley (Rheintal), an area of outstanding natural beauty. In fact, the stretch of river extending from Mannheim in the south to Koblenz in the north boasts scenery so spectacular that a large section, referred to as the Rhine Gorge (Rheinschlucht), has been designated a UNESCO World Heritage Site. Thanks to its many castles and historic towns, this stretch of the Rhine has for centuries influenced artists, authors, and composers. These days, it's as popular among day trippers as it is with those staying for longer visits, with opportunities for hiking or cycling its many long-distance trails and bike routes, or hopping aboard a riverboat for a day-long or extended river excursion. 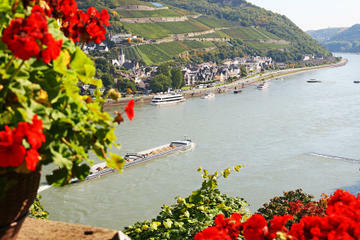 Explore this scenic region with our list of the top attractions in the Rhine Valley. The most scenic section of the Rhine Valley, the Upper Middle Rhine Valley — often simply referred to as the Rhine Gorge — stretches for 65 kilometers from the beautiful city of Koblenz all the way to the town of Bingen am Rhein. It has been designated a World Heritage Site by UNESCO in recognition of its importance in terms of the history, geology, culture, and industry of this region of Germany. Rich in unique flora and fauna thanks to its microclimate, it's a fascinating section of the Rhine Valley to explore, especially if you extend your visit with a stay at an authentic guesthouse or inn situated in any one of the many quaint towns and villages that cling to the riverbanks between the Rhine and the cliffs. Notable examples of great bases from which to venture out and explore include the towns of Boppard, Lahnstein, Braubach, and Bacharach, to name but a few. Whether you choose to see the Rhine Gorge from the comfort of a car or while cycling or walking along the banks of this mighty river, you can't fail to be impressed by its steep cliffs, especially in places like the famous Loreley Rock, a huge rocky outcrop that rises vertically to an impressive 200 meters in height. 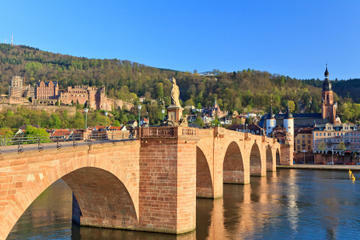 Better still, hop aboard a full-day Rhine Valley River Cruise from Frankfurt, which will then whisk you by riverboat to historic Rudesheim and Lorely, stopping for a riverside lunch along the way (a half-day tour option is also available). Another great full-day river cruise runs from Cologne to Königswinter and provides a number of great sightseeing opportunities. Along the way, you'll hear plenty from your expert guides regarding the many important old castles and churches you'll see, one of which — Drachenfels — you'll be able to visit (alternatively, you can visit the fun Königswinter Sea Life Aquarium). The old cathedral city of Mainz lies on the west bank of the Rhine opposite the mouth of the River Main, just 44 kilometers west of Frankfurt. Located in the midst of many of the most important Rhine Valley attractions, Mainz is an ideal location from which to explore this beautiful region of Germany. South along the Rhine are the picturesque old towns of Worms (famous for its cathedral) and Mannheim (famous for its medieval architecture), while to the north is the spectacular UNESCO World Heritage site of the Rhine Gorge. Mainz itself boasts a rich and diverse heritage, which dates all the way back to Roman times, much of it recorded in excellent museums such as the Roman-Germanic Central Museum (Römisch-Germanisches Zentralmuseum), which maintains some of its most important artifacts in the historic Electoral Palace in Mainz, and the Museum of Ancient Seafaring (Museum für antike Schifffahrt), with its stunning full-scale replicas of Roman galleons. Another highlight is the Gutenberg Museum, with its fascinating displays depicting the life and times of the inventor of the moveable metal type printing technique, who was born here in 1398. The cathedral city of Worms, located on the west bank of the Rhine, is one of the oldest towns in Germany. A highlight of a visit should be the 11th-century Cathedral of St. Peter (Wormser Dom). With its four round towers and twin domes, this spectacular old building ranks, along with the cathedrals of Speyer and Mainz, as one of the finest achievements of the High Romanesque architectural style. The nave is particularly impressive, rising some 27 meters tall, while its domes reach heights of 40 meters. Interior highlights include five Late Gothic sandstone reliefs from the old cloister, its fine choir stalls, and a superb Baroque high altar. Other buildings of note in Worms' Marktplatz are the early 18th-century Trinity Church, with its fine interior, and the 10th-century St. Magnus' Church. Thanks to its favorable location on the east bank of the Rhine, Mannheim has served as one of Europe's most important (and largest) inland harbors. It's also a relatively new city by European standards, and was laid out in the early 17th century on a grid of rectangles, much like most North American cities. Pedestrian-friendly and fun to explore, the cultural center of the city revolves around the historic Marktplatz with its Old Town Hall (Altes Rathaus) and the Lower Parish Church (Untere Pfarrkirche), erected in 1723, along with the nearby Jewish Center (Jüdisches Zentrum) with its synagogue. Other important points of interest include Mannheim Baroque Palace. Completed in 1760 and one of the largest such palaces in Germany, it's a delight to explore, with highlights including the magnificent Knights' Hall and the grand Imperial Quarters, notable for its elaborate decor. Shoppers are also well catered to, with the main shopping areas focusing on the Planken and the Kurpfalzstrasse, which intersect in Paradeplatz. Be sure to spend time sightseeing around the port area, too. Here, you can pick up a fun harbor cruise and tour the historic paddle steamer, Mannheim, now a museum dedicated to the history of navigation on the Rhine. The Pfälzer Wald, or Palatinate Forest, is a heavily wooded upland region on the left bank of the Upper Rhine. Covering an area of 1,770 square kilometers, it's one of the largest expanses of forest in Germany and completely surrounds towns such as Kaiserslautern and Pirmasens. The hills rise very gradually from the Saar basin in the west and then fall steeply down to the Rhine plain in the east, with many of the highest peaks, such as the Kalmit at 673 meters, crowned by the ruins of old castles. Much of the region has been designated as a nature preserve — the Palatinate Forest Nature Park (Naturpark Pfälzerwald) — featuring many excellent trails, making it a wonderful place to spend time hiking and biking. Other popular outdoor activities and adventures to enjoy here include camping, birdwatching, ziplining, and rock climbing. On the eastern border of the Palatinate Forest lies the little town of Wachenheim, a community that is well-known for its grape-growing traditions and old-world charm. Here, the top attractions are the ruins of the Wachtenburg castle, with its spectacular views over the Rhine Valley and surrounding forests, as well as Schloss Wachenheim, dating from 1730. Southwest of Wachenheim, the Kurpfalz-Park is home to an assortment of big game, as well as a fun summertime toboggan run, a mountain coaster, and other fun activities. Mere minutes from Wachenheim, the spa town of Bad Durkheim is also along the grape-growing route and is famous for its curative mineral springs. Wiesbaden, capital of the Land of Hesse, lies at the foot of the wooded Taunus hills and is as famous for its many thermal springs as it is for its beautiful surroundings (the town's name literally translates to "meadow baths"). Traces of its long history as a spa and tourist town are evident everywhere, from the spectacular Fountain Colonnade in Kurbezirk to the famous Kurhaus, an imposing building built in 1907, which boasts a massive Ionic portico. Beyond the Kurhaus is the Aukammtal spa district, with its numerous thermal baths and saunas, along with the Kochbrunnen, home to 15 springs with average temperatures of 66 degrees Celsius, and the Kaiser Friedrich Baths, dating from 1913. Also of interest is the magnificent Biebrich Schloss, built between 1698-1744 and a superb example of Baroque architecture; and the Neroberg, a 245-meter-high hill with its conspicuous Greek Chapel and the Opel Baths. Wiesbaden also offers a number of excellent hotels, many with spas of their own, for those looking to extend their stay in this wonderful part of the world. Koblenz, the former residence of the Electors of Trier, lies in a beautiful location at the junction of the Mosel and Rhine rivers. The Old Town area boasts numerous well-preserved historic attractions, from the spectacular fortress of Ehrenbreitstein to the Neoclassical Koblenz Schloss, built in 1786 by the last Elector. Another important fortification to explore is Stolzenfels Castle (Schloss Stolzenfels), a picturesque structure built in the 19th century just outside Koblenz that boasts an equally attractive park-like setting and gardens. Other historic highlights are St. Castor's Church, founded in AD 836 and where the Treaty of Verdun was signed in AD 843 that divided up the Carolingian empire. One of the city's most famous locations, however, is the German Corner, or Deutsches Eck, the narrow tongue of land between the Rhine and the Mosel. Watching these two mighty rivers converge here is a truly inspiring sight, one that's marked appropriately by the Monument to German Unity. Another interesting thing to do in Koblenz is visit the Deutschherrenhaus, the remains of a castle of the Teutonic Order, which also serves as a popular spot during the summer for its evening music concerts. Also fun is taking the new Koblenz cable car (Seilbahn Koblenz), which travels between the river and Ehrenbreitstein castle, with plenty of great views to enjoy along the way. In the heart of the UNESCO World Heritage section of the Rhine Valley, the picturesque old town of Braubach, on the east bank of the river, is the most northerly of the region's many pretty towns. With its wonderfully crooked old streets and alleyways lined with medieval half-timbered buildings, it's a delightful place to explore. Other highlights include the 13th-century Barbarakirche church, the 11th-century Martinskapelle chapel, as well as surviving sections of the Old Town walls. At the center of the town, perched high atop a hill that towers over the surrounding area, sits Marksburg Castle (Schloss Marksburg), built in 1117 and the only hilltop castle in the Rhine Valley to have survived intact. Visitors can spend hours exploring the castle and its grounds, highlights of which include its four-story chapel tower, the great hall, and batteries of old cannons. Of special interest is the castle's splendid interior, which can be enjoyed as part of a 50-minute guided tour (English language tours are available). There's also an on-site gift shop, and fun medieval-themed dining is offered close by. The Rhine's importance to the Romans is nowhere more evident than the town of Boppard, where some 2,000 years ago, they set up a fortress to guard the river. Evidence of this and later Roman fortifications can still be seen in the Roman Fort, or castrum, widely considered one of the best-preserved late-antiquity fortresses in Europe. Highlights of this 4th-century site are the remains of its 28 semi-circular towers, as well as the large sections of old wall that rise in places as high as nine meters. In its heyday, this once massive structure covered an area of 12 acres. Not only can you wander this ancient fortress, you can also view important relics from its excavation in the town's museum. The town's first Christian church was also built here, a site now occupied by the late Romanesque St. Severus Church. Another old building to visit is the 15th-century Ritter-Schwalbach-Haus, the former home of members of the town's aristocracy. Boppard is also a popular getaway destination for those who like to shop, and also offers a good selection of hotels for those wanting to extend their stay. It's also a popular spot for those looking to enjoy a good meal, with one of the most popular restaurants being Gedeonseck (or Gedeon's Corner), named after the 240-meter-tall hill on which it's perched. And getting there is half the fun. Most visitors choose to arrive via the 20-minute ride aboard the Sesselbahn Boppard chairlift up (and down) and linger awhile after dining to enjoy the panoramic views over the largest bend in the Rhine river. Rhine River Tour Pass: For those wanting more time to explore the many old historic fortifications located along the beautiful Upper Middle Rhine Valley — the Rhine Gorge — the Rhine River 20 Castles Boat Tour Pass is an excellent option. This extremely flexible day-long pass allows purchasers to start their adventure aboard a regular ferry service in river ports including Mainz or Rüdesheim and simply hop on and off whenever the urge suits you at any one of 19 designated medieval towns along the way. While on board these comfortable vessels, grab a coffee or tea and, weather allowing, take a seat above deck and soak up the spectacular scenery provided by such landmarks Loreley Rock (restrooms and a restaurant also available).